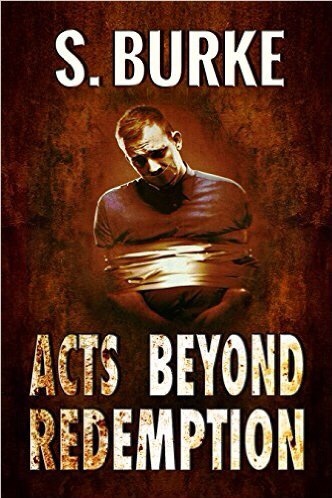 A brief glimpse into “Acts Beyond Redemption.” – Welcome to the World of Suzanne Burke. And I looked, and behold a pale horse; and his name that sat on him was Death, and Hell followed with him. And power was given unto them over the fourth part of the earth, to kill with sword, and with hunger, and with death, and with the beasts of the earth. The 747 had been in the air for eleven hours. It was a rough trip, heavy turbulence ensuring the barf bags had a purpose to serve. The passengers had been quiet for the most part. Strangers all, no real attempt at conversation was made. Each of the young men appeared to be deeply enmeshed in their own thoughts. One of them passed the time watching several of the others push up their sleeves to glance at watches that were no longer there. It amused him to see them pat themselves down seeking the comfort of their cellphones, which had also been taken, together with any jewelry the men may have been wearing. The window shutters were down and locked, affording no one the benefit of identifying in which direction they were traveling. The plane landed in a storm, and taxied into a purpose-built hangar. The travelers were split into two groups of fifteen. They were directed to two buses and once seated were blindfolded securely and handcuffed to ensure those blindfolds remained in place. This was not unexpected; they had been told that security was tight. “Where do you suppose we’re headed?” one of them asked his seating companion. “Don’t know, don’t care. Don’t feel like talking either,” was the surly response. The outside temperature felt much colder than their point of departure had been. It had been a long flight. With no sunshine to guide them and no stars to be viewed, they had no idea where on the planet they were, they didn’t care. This was all about the money. More money than any of them had even dreamed of having. They couldn’t care less what they had to do to earn it. The buses carried thirty healthy young men, with five things in common. They were all under thirty years of age. They were all capable of killing another human being if the conditions and the money were right. They each had olive skin and dark hair. They were all discards; who had never found parents who wanted to keep them. All had failed the parameters on entering law enforcement agencies due to their psychiatric assessments. The consensus reached by analysis was that they each had ‘sociopathic’ tendencies. They weren’t the first busload of young healthy men to pass through the heavily guarded sentry gates. They would, however, be the last. Recruitment had required a skilled team months of searching. This load consisted – as did the others – of young people that slipped through the cracks of society through their own skill and ability to manipulate others, and the capacity to survive at any cost. Detailed profile reports indicated they would be capable of offenses ranging from assault to murder, with barely a thought to consequences. They were exactly the types the recruiters of this particular unit wanted; healthy nobodies, nobodies who could be trained to be killers without anything other than a large cash bonus as the incentive. The bus went through a long tunnel and entered an underground area, well-lit and guarded. The blindfolds and handcuffs were removed and they all blinked in the harsh lighting. The uniforms of those standing in a tight group awaiting their arrival were not familiar. They were directed through a set of electrified gates, a couple of hundred yards beyond which appeared to be accommodation huts. None of them attempted conversation. None had a wish to become even vaguely friendly with any of their suddenly inherited brethren. A man, taller than most, exited a building with no windows, off to the left of the group. They watched him approach, each of them now utilizing differing degrees of testosterone charged body language. The tall man spoke to the two other men wearing uniform, then turned and stood looking at them much as you would at cattle on display at an auction. When he spoke, it was clear, and crisp. He stopped and watched them for a full minute, until they could no longer hold his gaze. He smiled in grim amusement as they began to look away, then he continued in the same tone, “Those of you that do their absolute best, yet still fail up to week twelve, will be paid well for the time spent here and returned to their city of origin. You are not here because of your unwavering patriotism. You are not here because you are the best and brightest America has to offer. The silence that followed was absolute. Four of the group did not raise their hands. The members of the small group looked at each other and took one pace forward. “What didn’t you understand?” He pointed at one of them. “Fine. I don’t like people wasting my time. Fall out here and you can re-board the transport. “The rest of you will be spoken to further after you have changed clothing. I leave you with Denver. You will address him at all times as ‘Denver’ or ‘Sir’. That is all. At ease.” The man strode off with another who had been standing to the rear of the group. This one wasn’t quite as tall, but somehow he looked more menacing in his black jeans and shirt. “Yes, sir!” The group, minus the four who had made the decision not to stay followed Denver across a long expanse of yard, rounded a corner and found a group of de-mountables waiting. Denver walked up and down the two lines of remaining men, with a clipboard and photographs of each of them; he confirmed their identity to his satisfaction and grouped them in lots of four. Giving each group a number, he directed them to their allocated accommodation. The four dissenters in the group re-boarded a bus and were again driven through the tunnel. They arrived at an airstrip and disembarked waiting for instructions to re-board a plane. Two uniformed men escorted them out to the tarmac. There was no plane. The four men stood quietly waiting for further instructions. The guards opened fire and the four of them dropped, dead before they hit the ground. One hour later, without explicit confirmation of death, they were thrown in a communal grave and burned, along with the others that had decided not to play.